Animal Defenders International (ADI) has congratulated the Scottish Parliament for being the first nation in the UK to ban the use of wild animals in travelling circuses. MSPs unanimously voted through the ban at the final Stage 3 debate for The Wild Animals in Travelling Circuses (Scotland) Bill, which now awaits Royal Assent. Although there are currently no wild animal circuses based in Scotland they have visited in the past. 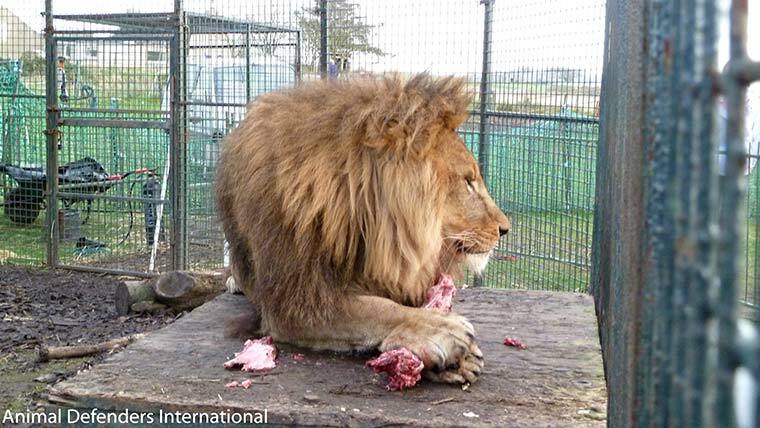 There was an outcry when Thomas Chipperfield brought his lions and tigers to overwinter at a farm near Fraserburgh in 2014, ADI revealing the conditions in which the animals were forced to live. Prevented from performing in England over welfare failings, the big cat circus trainer subsequently toured Wales and has since remained at a fixed location in Staffordshire where ADI has again documented the animals living in cages on the back of a truck, with restricted access to an exercise area. Given the constant travel and their temporary nature, circuses cannot provide animals with adequate facilities to keep them physically or psychologically healthy. Welfare is inevitably compromised says ADI. Animals in circuses can also be subjected to brutal training methods and violence – wherever ADI has conducted an undercover investigation in the UK and around the world it has documented acts of abuse. Expert analysis of scientific evidence undertaken by Professor Stephen Harris at Bristol University last year concluded, “The available scientific evidence indicates that captive wild animals in circuses and other travelling animal shows do not achieve their optimal welfare requirements.” The report stated that: Life for wild animals in travelling circuses…does not appear to constitute either a ‘good life’ or a ‘life worth living. According to ADI, more than 40 countries around the world have introduced prohibitions on animals in circuses to date and opinion polls consistently show that the public remains overwhelmingly opposed to wild animal acts, with a high proportion against all animal acts.